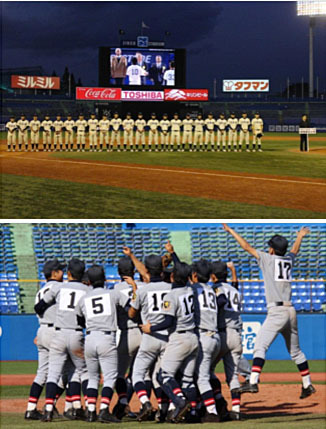 The final games of the 43rd National Championship at Meiji Jingu Stadium in Tokyo on November 14 produced new champions for both University and High School divisions. Sendai Ikuei Gakuen High School (Miyagi Prefecture) won Kanzei High School (Okayama Prefecture) 12 - 4 and Toin Yokohama Unversity (Runners-Up of 5 Leagues in Kanto Region) upset Hosei 1 – 0. This was the second appearance in Meiji Jingu National Championship for Baseball Club of Toin which started only 7 years ago. On the other hand, it was a disappointment for Hosei University Baseball Club (Champion of Tokyo Big-6), which started in 1915 and had been aiming for the Gold Medal in 31 years at the 15th appearance of this Championship.